I make a special dedication to my mother, Francine Marshall, who was one of the most inspiring and strong women I ever knew. She gave me and taught me unconditional love and acceptance. My mother passed away very suddenly and unexpectedly near the end of 1998, due to complications of Multiple Sclerosis (what some know as a “Sudden Onset Hypertensive Episode”, which killed her instantly). The sudden and traumatic manner of her death threw me and my family into a tailspin. But her death was a strange kind of gift in the end – a spiritual gift of personal discovery and growth. Mom was such a tower of strength to everyone who knew her – but most especially to me. Her battle against the MS that attacked her body was a prime example of that strength, and her drive and determination. Mom’s example of strength and determination kept me going many a time when it may have otherwise been a whole lot easier to just be complacent and go with the flow. Mom encouraged me daily, from a very young age, to reach for my dreams, no matter how far-fetched society may have deemed them. When I dreamed of being an astronaut, and delved into physics and astrophysics, Mom was my biggest supporter and advocate – relishing the fact that I was going against the “norm” and “conquering” what was, at the time, considered a “man’s field”. When I received my M. Sc. in Astrophysics, Mom jumped for joy. When I immediately landed my dream career as a meteorologist and began moving around Canada in that capacity, Mom glowed with pride, giggling like a school-girl when she would hear my voice on the radio telling the public what the weather would be like for the day. Mom was a very spiritual woman – believing and teaching through her strength and acceptance that each of us has our own inner light. She believed very strongly in every person’s right to be whoever and whatever they wanted to be in life, and to make mistakes along the way as they struggled to become that person. She did not judge nor condemn. 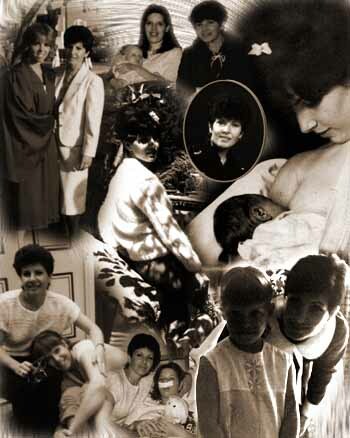 Mom always inspired me to be the best that I could be – and she always will. Mom passed away before we had any idea that I would ever be diagnosed with multiple sclerosis myself. But… because of the lessons Mom taught me, not only throughout life, but in her own struggles with her MS, I have the faith, drive, and courage to face my own struggles with MS and not see myself as a victim, but as a whole and strong person who just happens to have a chronic disease. Mom taught me to deal with MS with Attitude! Thanks, Mom – you are missed.